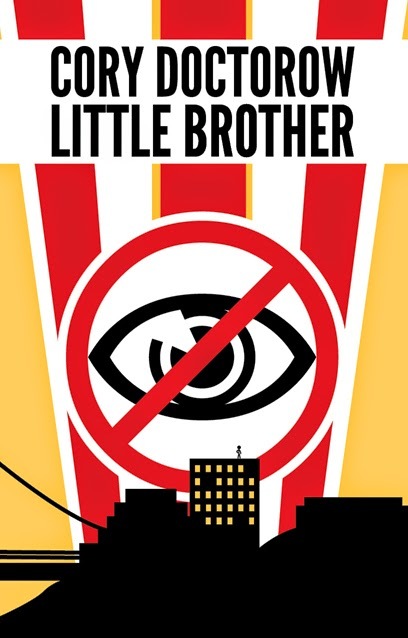 Little Brother is the kind of book that you sort of feel like you should get arrested for reading. Not that you want to get arrested, mind. The book is incredibly clear on that topic, and completely without the usual bravado of the genre, in establishing that prison is horrible and disgusting and that no one stands up under interrogation at first. So it's not like it makes you want to be arrested. It just sort of makes you feel like maybe you ought to be. Or you're going to be. One or the other. I should probably back up. 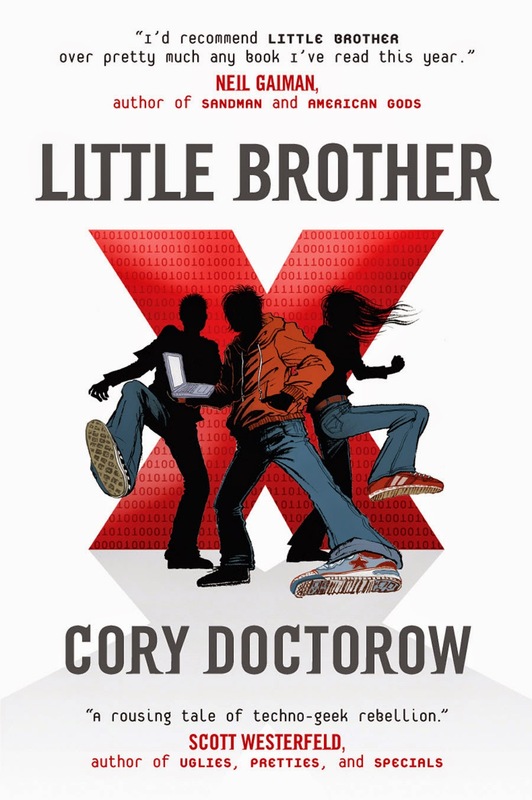 For those of you unaware, Little Brother is the first young adult novel from Cory Doctorow. Doctorow has a history of writing books I have mixed feelings about, but overall I like him. He's amazing at the "novel of ideas" thing, and if that sometimes translates into less than stellar plot or character development, well, I guess I can forgive him. In this case, though, the book suffers from neither insufficient plot, boring ideas, or even a lack of character development. It's a great book. It's also, and this is the main thrust of my point today, an inherently subversive one. Which is fine. Good, even. The plot of the book is fairly simple, though I'm going to have to go broad strokes to avoid giving anything away. It's written from the perspective of Marcus Yallow, a seventeen year old hacker living in San Francisco. He and his friends all prefer computer and video games to real life, and they've become experts at getting past security protocols on their favorite consoles as well as in their schools. So it's no big deal for them to all ditch school one afternoon and tool around the city playing their latest favorite game. No fuss, no muss, just the four of them: Marcus, Darryl, Van, and Jolu. And then the Bay Bridge between San Francisco and Oakland blows up, killing thousands in a clear terrorist attack on American soil. Marcus and his friends race for shelter in the BART station, but in the crowd Darryl is stabbed, so they decide to take their chances on the street. When they try to flag down a cop to get Darryl some help, they accidentally flag down an armored truck full of Department of Homeland Security special forces, and suddenly these kids have to explain why they are a) out of school in the middle of a school day, b) not in a shelter, and c) in possession of so much high tech encrypted software. It doesn't go well for them. Marcus and Van and Jolu spend days rotting in cells in some underground bunker, being interrogated, and finally spilling their guts about their online habits if only to prove that they really are innocent. They forfeit their privacy and their dignity, and eventually, eventually they get to go free, with the understanding that they will be watched. But Darryl doesn't. In fact, none of them see Darryl again after they're taken. Immediately upon getting home, Marcus realizes that he can't tell anyone what happened, because they'll never believe him. Homeland Security has his whole city on lockdown and even Marcus' parents have gone from well-meaning hippies to ultra-conservative supporters of National Security in the aftermath. There are cameras everywhere. Random searches. Citizens are tracked and tagged and taken in for questioning regularly. San Francisco becomes a police state. And Marcus? Marcus fights back. With all of his technological powers and awareness of how to be sneaky online, Marcus and his friends create a way for freedom of speech in an increasingly hostile city, and try to show that if we allow ourselves to curtail freedom in the name of security, then the terrorists have actually already won. If we let them make us afraid, well, isn't that what they were after all along? Besides, the government only exists so long as we the people deem it useful and necessary. Once it's stopped being those things, it's time to overthrow the government. It's really no surprise why I love this book. I mean, sure, it's not the most subtly plotted thing on the planet, and I definitely do think that several of the plot points are a bit much, but that doesn't matter. Not really. Not in the face of how much I love love love the revolutionary fervor that streaks through the pages, or the ideological bent, or the fact that while this is definitely a novel, it's also effectively a handbook on how to use the internet as a platform for free speech without being caught by surveillance. I love all of those things. So much. But most of all I love that this is a book about being subversive, and it's a book that actually believes in what it's selling. If what I've said so far sounds interesting, then you should probably just read the book. Here's a link to where you can download it for free. Seriously. Cory Doctorow, the author, believes so firmly in the freedom of the press that he actually releases all of his books in print editions and as free ebooks. (He also has an option where you can donate money to his foundation to buy physical copies of the book for teachers and libraries, because he is a standup guy.) So we're already off on this whole, "the writer isn't messing around" thing. But there's more. 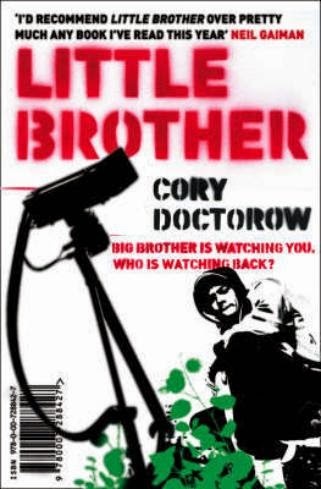 While a lot of Doctorow's books involve technology that doesn't yet exist but probably will soon, everything in Little Brother is actually real. It's not so much science fiction as it is science fact. While a lot of the stuff in there is put to a different use than we've ever seen before, and there are some liberties taken with brand names, it's not hard to realize that with a quick google search (probably put on a proxy before searching that stuff, for the record) you can find most of Marcus' hacks and howtos online for anyone to discover. All of this is awesome and amazing, and is the reason why someone as terrible at computers as I am can actually manage to be somewhat secure online, as well as how I was able to go on Facebook when living in a firewalled country. I mean, that's one of the lamer uses I could have put all this amazing technology to, but still! Super cool. It's interesting because in making the technology something that exists and is accessible, and then filling the narrative with plausible situations and clear directions on how to dissent, what Doctorow seems to have done is create a manifesto of internet privacy, a guide to how to implement it, and a handy little plot about what might happen if you do. So when I say that Little Brother is an inherently subversive book? I really mean it. One of the main themes of the book is that having secrets doesn't make you a bad person. Just because you like your privacy doesn't mean you are automatically a criminal. And, larger point, the protocols we set up to catch bad guys often have a really big problem: they catch too many good guys, and therefore the bad guys slip through in all the noise. If you want to fight fear, then the last thing you should do is make people more afraid. If you want to make people safe, you give them the tools to be empowered in their safety, you don't treat them as a risk. This is important because we so often forget that a social contract goes both ways. On the one hand, we as citizens are required to partake in certain ways in our government as a repayment for the ways in which we benefit from it. Because we use roads and go to schools and enjoy police protection, we pay taxes that fund these things. Because we enjoy trials by jury, we are required to register for jury duty. Because we enjoy a representative government, we are (strongly) encouraged to vote. Etc. We are to keep up our end of the social contract. But like I said, this goes both ways, a fact most government spokesmen seem intent on helping us forget. While we are required to pay taxes, we also get some say in how those tax dollars are spent. Because we are required to serve on a jury, we should enjoy the benefit of getting a fair and decent trial. Because we vote, we should be entitled to a representative government. It's easy to forget that these ideas go both ways. It's all part of a larger problem: we are encouraged to see our government and ourselves as two separate entities. Like there's America and then there's the government. Or there's the people and then the government. It's us versus them. But that's not supposed to be how it works. Our government is supposed to be made up of us. We are supposed to be made up of our government. The instant we start drawing lines defining who is and is not part of the governance of our country, we have failed to be a democracy. And spying on your own citizens is a big part of that. I think we all remember the NSA hacking scandals that came to light less than a year ago. But I think it's also important to remember some earlier problems we had with this. It's not a recent phenomenon. Take, for instance, my family. My last name is Pless. It's a pretty bland last name, and up until a few years ago, we actually had no idea where it came from. Turns out, it's the name of a town in southern Germany. Here's the thing: that part of my family isn't German. It's Ukrainian. So where did our last name come from? All we know is that the suspicion of being a communist was so strong that my grandfather literally changed his name and moved cities to avoid it. And it followed him. He lived with the stigma of communism for the rest of the Cold War. That's pretty messed up, right? Well, it still happens today. A lot. Read How Does It Feel To Be a Problem? by Moustafa Bayoumi if you don't believe me. 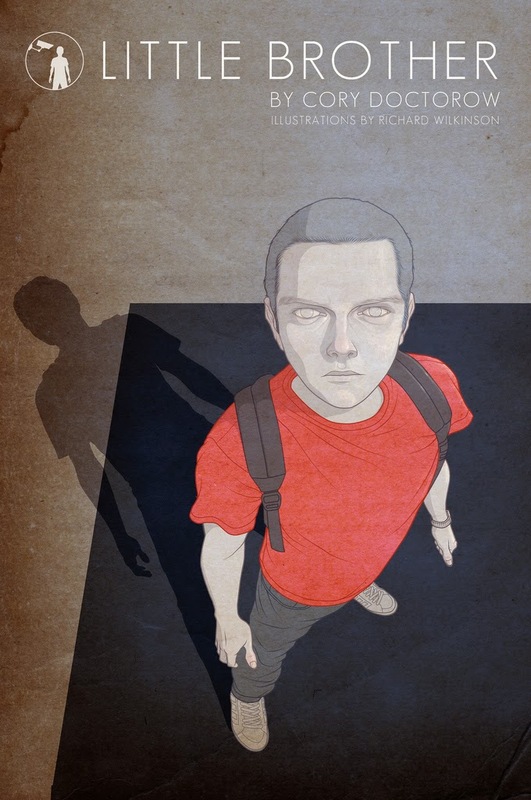 Little Brother is a book about a white, middle-class boy facing the kind of discrimination usually felt by minorities and immigrants and anyone deemed less than desirable. There's a real sense in which you kind of want to shove his face in it a lot. But there's a bigger sense in which you want Marcus to beat the system. You want him to win. Why? Because if you're anything like me, you think we've already gone too far. We're already living in a dystopia. And I would rather be free than safe anyway. I had an argument about this recently, about how a society can be both free and safe, and I came down this way: you can't. You can't be really free and also really safe. The key, then, is to find a different understanding of what it means to be safe. So, you can't enforce security protocols and force everyone to give up their liberties and say it'll make them safe. All you'll do is make people better at breaking protocols and sneaking things in. In college, we had a tradition of sneaking oranges into hockey games (long story). The campus police started searching bags and patting down students before the games. Did that work? Heck no! We just got better at smuggling. The other way to deal with this issue is to come at it from a social perspective. In other words, instead of making a community paranoid, make it aware. Instead of enforcing rules on them, give them the tools to do it themselves. Not only will you get better results, since people will be using their big brains for you not against you, you'll also make them a tighter, better community. If people have a common goal, and that common goal is to protect freedom, then they will care more about the people who try to take their freedoms away. You can't be both free and safe. The key is to realize that if you lose your freedom, you still aren't safe, you're just not free anymore either. 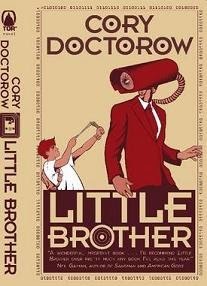 I say that Little Brother feels like a subversive book because I feel like it is a subversive book. In challenging our knee-jerk reactions to issues of national security and personal freedoms, the book seeks to shake you from your apathy, but it also kind of terrifies you. It makes you realize that the government isn't necessarily altruistic. But it also makes you realize that you are partially at fault for that. Better still, Little Brother gives you the tools needed to actually do something about it. So you no longer have an excuse. I would love to hear your thoughts on his follow-up, Homeland. Also, if you like Doctorow's subversive/character development-y stuff (I sure do!) For the Win is his best book by far. I just finished Pirate Cinema (which I liked, but not as much as this), and I have both Homeland and For the Win (and Makers) loaded to my Kindle and ready to go.